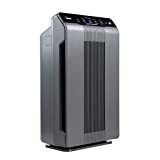 Winix - PlasmaWave 5300 : Air Purifier Review • The Air Geeks, reviews of air conditioners, dehumidifiers and air purifiers. The south Korean brand Winix, famous in its native country for its quality engineering and bold technological advances, has been recently introducing its flagship product in the United States. The PlasmaWave 5300 is an environment-friendly air cleaning system that is designed and optimized for large spaces. This system combines multiple filtration mechanisms to ensure that the air it discharges is clean and fresh. An unconventional, stylish and powerful united featuring a three-stage cleaning process, the WAC5300 has quickly become a best-seller in the country of Uncle Sam. And for good reasons, as our review shows. Let us introduce the Plasmawave 5300. One cannot help but be surprised by the looks of the WAC5300, whose frame resembles more that of a high-tech television than and air conditioning device. 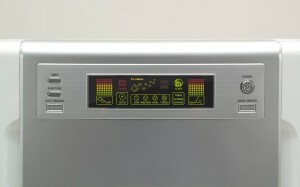 Its clear controls feature the choice of three speeds of filtration (with an additional “turbo” one), and its an indication of the present air quality (with a LED-based button that grades it from low to high – red to green). To effectively remove pollutants from the air, an air purifier requires more than one filtration mechanisms. The PlasmaWave 5300 combines superior filtration mechanisms to capture airborne particles from the air that goes through it. Air goes through a three-stage cleaning process before it is discharged. 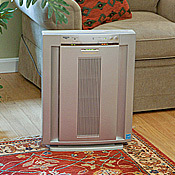 HEPA technology is one of the most effective mechanisms used in air purification. The PlasmaWave 5300 employs the true HEPA technology to remove pollutants of different types from the air that it collects. This filtration mechanism is combined with Plasmawave technology to eliminate as much pollutants as possible. This combination captures dust particles, pollen, mold spores, pet dander, and more. According to the manufacturer, this air cleaning unit removes up to 99.97 of contaminants from the air that goes through it. The Plasmawave technology is a highly effective filtration mechanism used in cleaning air. This technology breaks apart allergens, chemical vapors, odors, and other pollutants to ensure that the discharged air is clean, pure, and fresh. Various airborne pollutants are broken apart at molecular level to produce harmless byproducts. Carbon is commonly used in various air purification systems to remove bad smell. The PlasmaWave 5300 employs a carbon pre-filter to reduce odor from the air that it collects. You should not let bad smell to dominate your bedrooms or living room. Regardless of the source, this system ensures that the air it discharges is free from odor. This air purifier is suitable for capturing tobacco smell, bad smell from pets, and smell from kitchen activities. In case you have a large room that requires an air purifier, then you need to look for a powerful system. This air purifier is designed for rooms that are as large as 350 square feet. It offers an impressive rate of air circulation to ensure that the entire room has fresh and clean air. Unlike open spaces, houses and other enclosed spaces are prone to air stagnation. You should not allow air to stagnate in your room. This air purifier ensures that the air in your room remains fresh at all times. Some home appliances consume a lot of energy and they can have a significant effect on your electricity bill. The PlasmaWave 5300 is an ENERGY STAR rated system. It is designed to consume minimum energy and it is therefore friendly to your budget. In addition, this air cleaner is UL approved and AHAM Certified. Highly effective. This air cleaning system is designed to deliver great performance. Most people who have used different types of air purifiers concur that this is an outstanding system. Silence. The Winix WAC3500 is designed to run quietly and you can use it in bedrooms and other quiet places. The carbon filter is weaker than it should be. This air cleaner uses a carbon-impregnated fiber instead of carbon pellets, that most of its high-end competitors use. Do you have to care? Yes : this filter is good, but less effective as compared to the one that is made from carbon granules. Works well. Could use a handle, but is light enough to carry between rooms. Cleans air quickly after cooking sets off smoke alarm. Runs quietly when air not too dirty." Very happy with this unit. I also have a GermGuardian AC4825 with which I am happy, but Winix is much quieter. Ideal for the bedroom." The PlasmaWave 5300 is a powerful air cleaning unit that combines three filtration mechanisms to ensure that the discharged air is free from common airborne pollutants. This system integrates effective technologies to capture pollen, pet dander, dust, and bad odors. It is very silent and its intuitive and sleek design satisfy its owner. One minor complaint that we have is its carbon filter : a “carbon-impregnated” filter (no carbon pellets or granules), which is weaker in comparison with competitors.